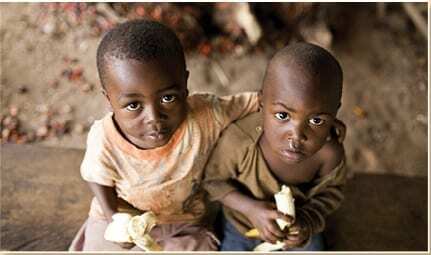 USAID Grant Helps MFH Provide Food Assistance to Children in Haiti. Medicines for Humanity (MFH) is very proud to be awarded a USAID food assistance grant through the Food for Peace Office. 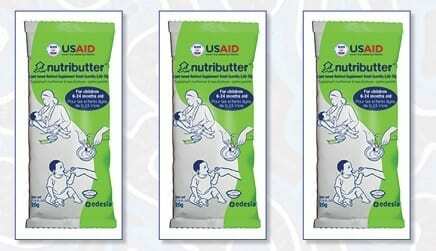 This International Food Relief Partnership grant will allow MFH to provide vulnerable children in Haiti with Nutributter, a nutritional supplement that helps to prevent malnutrition. Over the next 18 months, MFH will work to distribute Nutributter to toddlers in seven clinics operated by an order of Catholic Sisters in Haiti. This effort will improve nutrient intake for as many 12,000 children and provide nutrition education to parents to help families stay healthy after the project has ended. The partnership aims to address chronic malnutrition and stunting, which affects approximately twenty percent of children in Haiti. This project is made possible by the generous support of the American people through the United States Agency for International Development (USAID). Please Note: The contents of this announcement are the responsibility of Medicines for Humanity and do not necessarily reflect the views of USAID or the United States Government. Over the past year in Cameroon, there has been ongoing political tension, unrest and violence. The Anglophone part of Cameroon (approximately 20% of the population) feels marginalized and believes they are not receiving a fair share of government revenue. In November 2016, protests formed around the use of French in schools and courts. Several strikes occurred. The government responded by sending troops to assault protestors and fire on them. Subsequently, courts and schools were closed and have remained closed to this date. Curfews were instituted in some parts of the region. The strikes evolved into more demands for independence by the Anglophone community. The Cameroonian government – under the controversial, 35-year reign of President Biya - has reacted by installing military rule in the Anglophone region, clamping down on public movements and limiting rights. Police and armed troops move into areas where they suspect that leaders of the protest movement reside, and use forced entry to carry out arbitrary arrests and detentions. The secessionists’ movement has encouraged some residents to take up arms against the government. This movement instituted “no work/no movement days every Monday” across the entire NW and SW Regions. The situation is escalating and there is no clear resolution currently. The United Nations and Catholic Church are calling for dialogue, but the government has not been responsive. This past fall, elections were held on October 7th and the current president, Paul Biya, was declared the winner. The opposition rejected the results and violence escalated. More and more desperate families fled their homes and are hiding in forests. There is ongoing violence that is in a continual state of flux. Some areas are getting worse, while other communities grow calmer. The situation evolves daily. There has been an increase in kidnappings for ransom and violence. More than 181 villages have been burned and destroyed. More than 3,000 people have been killed. Over a half million people have been displaced. Medicines for Humanity has been monitoring and responding to the crisis from the start. As this crisis unfolds, our efforts to reach the most vulnerable with lifesaving health services are more important than ever. Most of our projects serve communities in the Anglophone region. MFH continues to operate essential health services, as well as provide support to the displaced population. Despite the closing of one clinic by the army and some Community Health Workers (CHWs) moving to safety, our more than 300 active CHWs – often at risk to their own lives - continue to provide desperately needed services to a population that is often threatened and under extreme duress. We have partnered with the Sisters of St. Therese and Diocesan Emergency Ad Hoc Committees to provide food and essential non-food items, delivery kits and transportation for pregnant women to the vulnerable, displaced population – some of which are in hiding. More than 5,000 families have received assistance. These relief efforts have expanded across all 5 Dioceses in the English-speaking part of the country. MFH recently advocated for U.S. intervention in the crisis through letters sent to U.S. Representatives. We continue to be deeply concerned for the safety and well-being of the thousands of mothers and children caught in the middle of this political upheaval, as well as our own staff and partners who are facing traumatic experiences daily, and personally sacrificing to help those in need. We continue to hope and pray for resolution and peace. Please make a donation in support of this emergency humanitarian crisis. Donations will be used for food support and health services for those in dire need. Grand Boulage is a small, rural town in Haiti, an hour and a half outside of the capital of Port-au-Prince. In December 2017, with support and collaboration from the Connecticut-based non-profit Seeds of Hope for Haiti (SHH), an MFH team of American and Haitian staff traveled to Grand Boulage to conduct a health assessment. We spoke to community members and leaders to learn about the health status of the population and their health needs. At the top of the list of issues was the lack of nearby clinics and hospitals. When people get sick in Grand Boulage, they must choose between a mobile clinic available only once per week or a hospital far away. The mobile clinic only provides consultations for 40 people each Monday and many sick people are turned away. The University Hospital is one and a half hours away – a significant challenge for people who don’t have any means of personal transportation. Limited access to healthcare means that that many of the common illnesses affecting adults and children in the area (i.e. fever, diarrhea, respiratory illness, tuberculosis, and skin infections) remain untreated and can become deadly. It also means that many women don’t receive prenatal care or delivery services. Our assessment found that 70% of women in Grand Boulage give birth at home, often attended by family members or Traditional Birth Attendants (TBAs) who have no formal training. Under these circumstances, simple complications and bleeding quickly become life threatening. 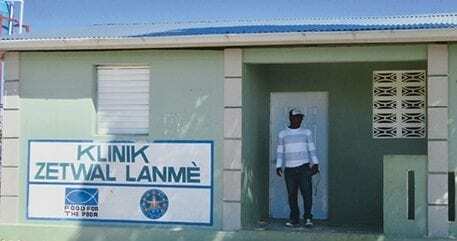 Our assessment concluded that it is vital for the Grand Boulage community to have an established clinic that can provide basic health services daily to all who need them. Therefore, MFH and SHH are partnering with Food for the Poor (FFP) to rehabilitate aclinic that was built in 2016 but has never functioned. Together with other partners – community members, Our Lady of Sorrows Church, the Haitian Ministry of Health, and the Little Sisters of St. Therese – we are updating the clinic’s infrastructure, purchasing supplies and medications, and hiring medical staff to provide consultations, lab exams, medications, first aid, and referrals for more intensive services. The clinic will open at the end of January. In addition, MFH will provide training to the TBAs who assist in home deliveries and work to strengthen their basic health practices, integrate them with the clinic management and encourage referrals of their women clients to deliver at the clinic instead of staying at home. Additionally, MFH will improve nutrition services for pregnant women and children in the community by initiating a clinic nutrition program that will monitor and treat children and pregnant women for malnutrition, including anemia. To encourage healthy food consumption, we will help families establish home gardens so they can grow nutritious foods themselves. This 3-year project is predicated on a foundation of close engagement with and leadership from community representatives to ensure the Grand Boulage community transitions to full ownership and support of the clinic. In Years 2 and 3, MFH will incorporate a program using community members to advocate and educate on health issues around the community. These Community Health Workers (CHWs) will make household visits to discuss and advise on healthy behaviors like handwashing, eating practices, immunizations and encouraging people to access care at the clinic. CHWs are essential links between the clinic and the community, and their outreach is critical to improving health outcomes for the long term. MFH is very thankful to be collaborating with Seeds of Hope for Haiti, the Grand Boulage community, and our other partners on this project. This partnership will inevitably make a great impact on the lives of many. If you are interested in collaborating on this program in Grand Boulage or to learn more about our programs in Haiti, please email Kristen Fanfant, Program Manager at kfanfant@medicinesforhumanity.org. To view our newsletter archives, please click here. Sign up for our newsletter to receive updates on news and events. © 2019 Medicines for Humanity. All Rights Reserved.